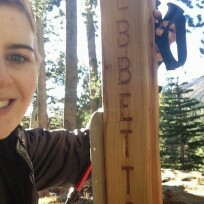 Mary Chambers, better known by her trail name “Scrambler,” never doubted she would complete the Pacific Crest Trail. “We’re going to finish!” she would declare whenever someone questioned whether she was capable of walking from Mexico to Canada in a single hiking season. And despite being only ten years old at the time and weighing less than 70 pounds, Scrambler did indeed finish her hike on October 25, 2004, reaching the Canadian border after a final struggle through the snows of the North Cascades. 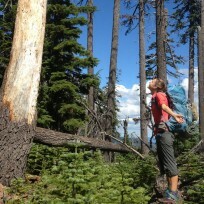 We began seriously considering a PCT hike when Mary was a month short of her sixth birthday. We hiked from Sonora Pass south to Tuolumne Meadows (76miles) that year and realized that Mary would soon be capable of so much more. 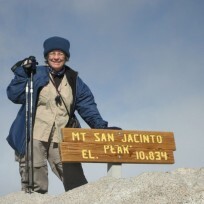 In 2001, when she was seven, Gary and Mary climbed Mount Shasta (14,180 feet above sea level). A few weeks later, the three of us hiked the Tahoe Rim Trail, making Mary the youngest person to backpack the entire 165 miles of the route. 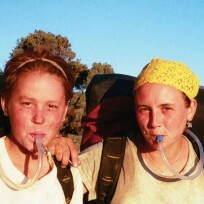 Rugged hikes closer to home taught Mary how to pace herself and how to handle camp chores. Mary adapted amazingly well to life on the trail. At home she was very feminine, dressing up in pink and lavender and trying elegant styles with her long hair. She was a stickler for privacy and good manners and surrounded herself with dozens of stuffed animals, dolls, and books. But on the trail she wore the same clothes for days on end, got dirty and sweaty, rarely complained about cramped sleeping quarters, and found ways to turn pinecones and twigs into toys. What were the high and low points for Scrambler? “It was hard getting through the snow,” she recalled. “We ran into abundant old snow on Fuller Ridge in Southern California and plenty of fresh snow in the last 70 miles from Rainy Pass to Canada. One thing that was easy was walking on the aqueduct,” she added. Thinking back to the miles of flat California desert where an aqueduct runs north of Highway 138. What did she miss most while on the trail? “Seeing my cats and friends. Also, good home cooking,” she stated. And when she went back to school, what did she miss about the PCT experience? “I miss not doing any homework,” said Mary. The bulk of the responsibility for our PCT trip fell on Gary, whose trail name of “Captain Bligh” reflected his skills as a navigator as well as his stern demeanor as trail leader. Completing the trail was as important to him as it was to Mary. When the weather seemed determined to defeat us, he became even more determined to finish and to bring us along, provided we could do it safely. Here are Captain Bligh, Scrambler and Nellie Bly enjoying a hike on the Glacier Peak Wilderness section of the PCT last September (2013). As for “Nellie Bly” – that’s me – I had all the fun of a backpacking trip without the loneliness of being away from my family. True, it was often very difficult. From hurt feet to hurt feelings, family ties sometimes became strained. But the hardest part for me was the three weeks I had to get off the trail while Mary and Gary continued. I developed severe shin splints and an abscessed tooth in northern Oregon and had to return home. 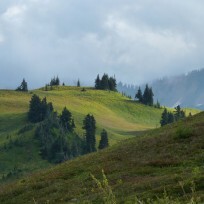 After an emergency root canal, I drove to Washington and became my family’s trail angel until my legs healed up. Although I saw Scrambler and the Captain every few days, I worried constantly about them, especially as the weather worsened. It was a relief when I rejoined them for the final 70 miles to Canada. I was apprehensive about the snow and a predicted storm, but I knew I would worry even more if I wasn’t with them. We were often asked how we managed to coordinate our schedules for a six-month hike. I was able to take an unpaid leave of absence from my job and was guaranteed employment upon my return. Gary was a stay-at-home father, so he took on the bulk of the preparations, from buying lightweight gear to planning for our cats. As for school, Mary’s teachers helped us enthusiastically, right down to putting Mary on an accelerated track for mathematics and having her sixth-grade books ready when we returned. Mary inspired many parents we met to think more ambitiously about their own offspring’s capabilities. I still remember the look on one man’s face as Mary jogged the final yards to the summit of Mount Whitney. He’d never thought of encouraging his own ten-year-old to aspire to climb a fourteener. 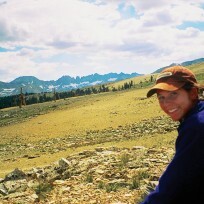 That said, Mary was an unusually athletic girl for whom the PCT was the high point of ten years of outdoors experience. Still, I believe Mary’s accomplishment shows that many youngsters – and their parents – are capable of far more than they realize. 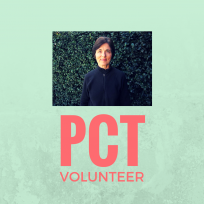 This article is adapted from a piece that appeared in the PCTA’s Communicator magazine. Mary is now 20 years old and attends Stanford University. Her parents Barbara and Gary live in Sunol, Calif., where Barbara is a freelance writer and book editor and Gary is a freelance photographer and online book producer. 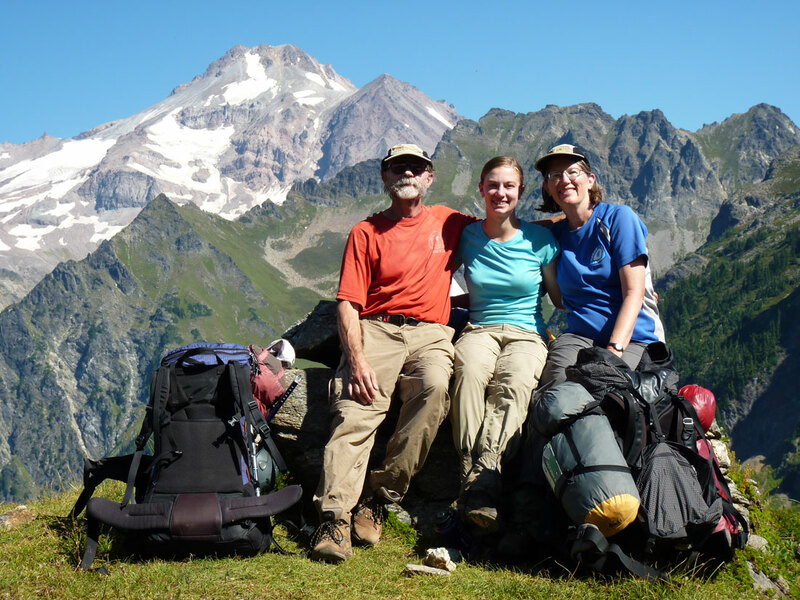 You can read more about this incredible family journey in the book Zero Days; The Real Life Adventure of Captain Bligh, Nellie Bly, and 10-year-old Scrambler on the Pacific Crest Trail by Barbara Egbert. (Wilderness Press, 2008). 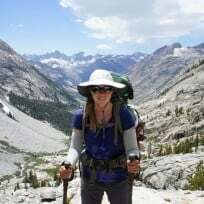 Upon the ten-year anniversary of their thru-hike, Barbara further reflects on the PCT’s impact on her life in another essay on this site.